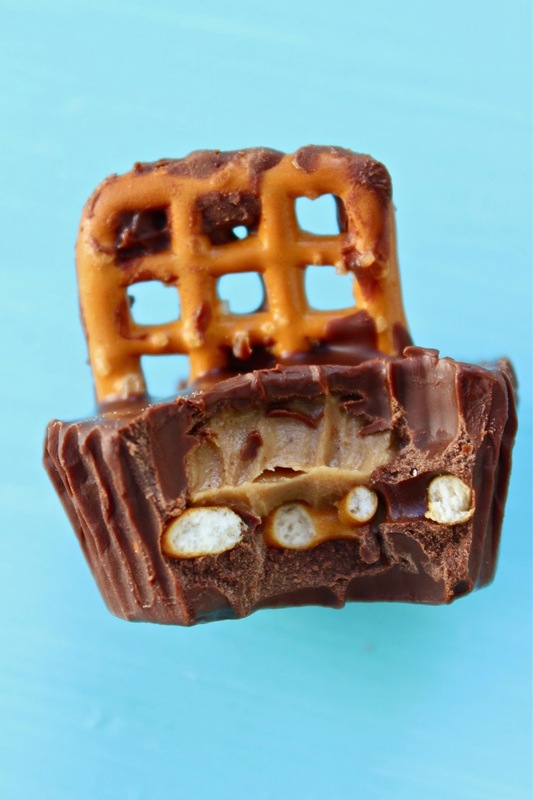 So I guess this is sort of becoming a tradition, me posting indulgent chocolate peanut butter recipes on my bloggiversary. This also seems especially appropriate since January 24th is national peanut butter day. I do enjoy celebrating random food holidays. I don't have as many inspiring words as last year, and I'm bringing you a much simpler recipe. 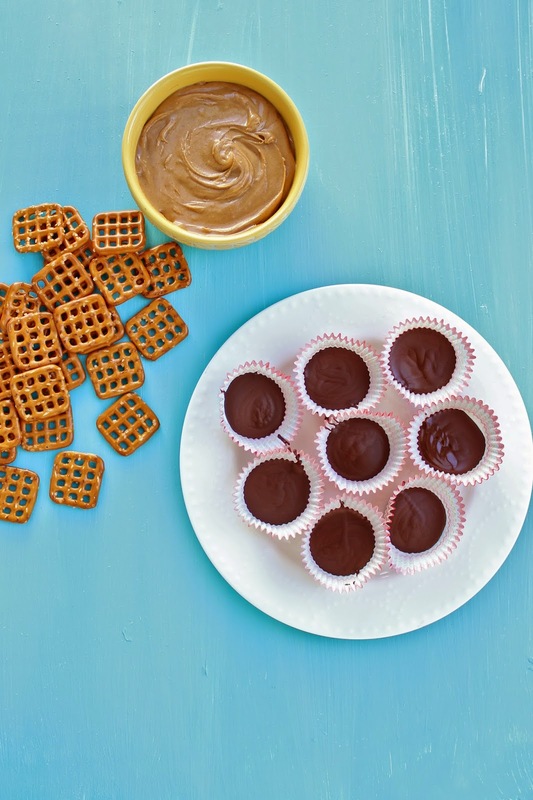 These chocolate pretzel peanut butter cups have 4 ingredients, require minimal dishes, and are made using only your microwave and freezer. These are super quick to put together, minus the hour that they need to solidify in the freezer. Don't worry, you can do the dishes while you wait. Maintaining the blog this past year has been harder than ever before. Life is just so dang busy, and many weekends I've found myself questioning why I spend so much time on something that (1) doesn't bring in any income and (2) isn't usually read by many people. Other weeks, I get caught up in the blog comparison game. There are soooo many food blogs out there in the universe, many with stunning photographs and eloquent writing and unique recipes. And then I think, "what am I really adding to the already over-saturated world of online recipe content?" Yet, whenever I voice these concerns aloud to friends or to Adam, they always respond, "Why did your start your blog in the first place? Was it to make money or have millions of people read it?" The answer to that last question is always no. Those would be lovely benefits, of course, but the real reason I started the blog was to have an outlet to write creatively, a space to connect with others, and a means to express my creativity by creating and photographing recipes. This blog may not always provide those things for me, but for now it does, so I'll continue to post. The older I get (and I guess the older this blog gets) the more I realize that comparing yourself (or your blog) to others is a lose-lose scenario. It really doesn't make sense to look to others to see who we should be. Our internal feelings of inadequacy and deep-seated fear of being outcast or alone fuel these comparisons. I think the impulse will always be there, but it will not always rule us. The more we can let go of the us/them cycle, the more we can focus our energies on developing and achieving the things that deeply matter to us. Not because someone else has them, but because we truly desire them. The tricky problem, of course, happens when our deeply held desires are being realized by someone else. I have found this is especially true along the continuum of serious relationship--engagement--marriage--professional success--house--baby. Jealousy and comparison can be particularly devastating in these areas, as noble and wonderful as all those desires are. But the thing is, jealousy and comparison doesn't achieve anything, other than making us antsy and depressed and more likely to say un-kind things to people we care about. So how do we stop the comparing? We practice being present, being thankful, and letting go. We remind ourselves of our achievements, and our worth, and the many things that make us happy right this minute. Yoga helps with this. So does chocolate, I think. I'd love to hear your thoughts on this. Thank you so much for reading and cooking along, friends. You're the best, for real. Place 8-10 mini muffin liners on a flat plate. 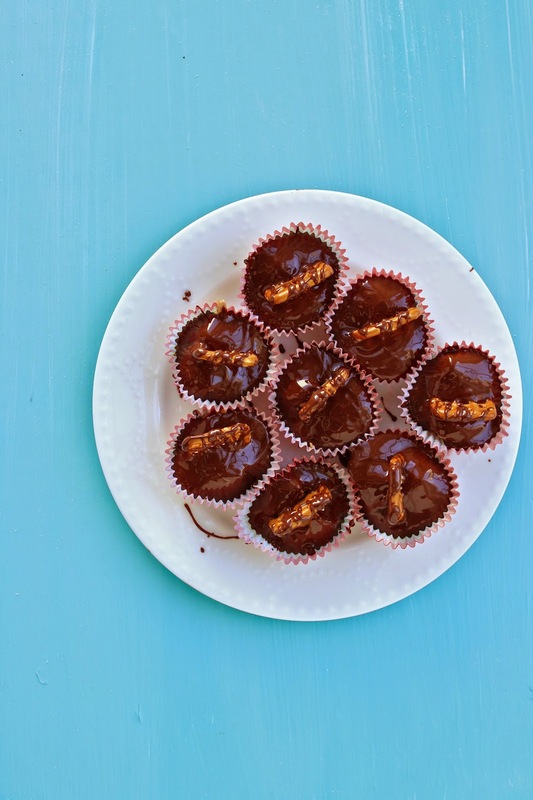 * Use a spoon to pour a small amount of chocolate into each muffin liner. You only want to cover the bottom. 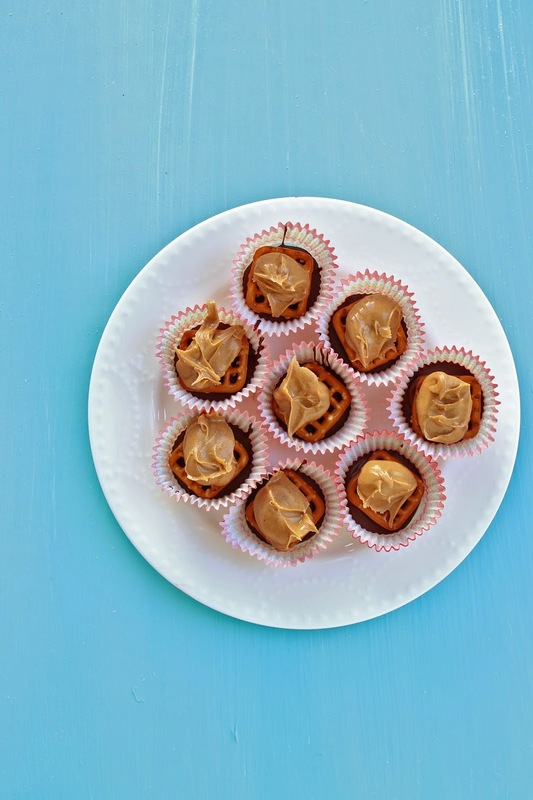 Place muffin liners in the freezer for about a minute or until chocolate hardens. Place one pretzel into each chocolate-filled muffin-liner. Fill one spoon with about a teaspoon of peanut butter. Use the back of another spoon to gently drop the peanut butter on top of the pretzel. Repeat with remaining muffin liners. Press a second pretzel gently into the peanut butter, so that the two pretzels are perpendicular to each other. The pretzels may tilt to the side. Just gently push them back up. Repeat with remaining muffin liners. Using a spoon, gently pour the remaining chocolate around the pretzels until all the peanut butter is completely covered. 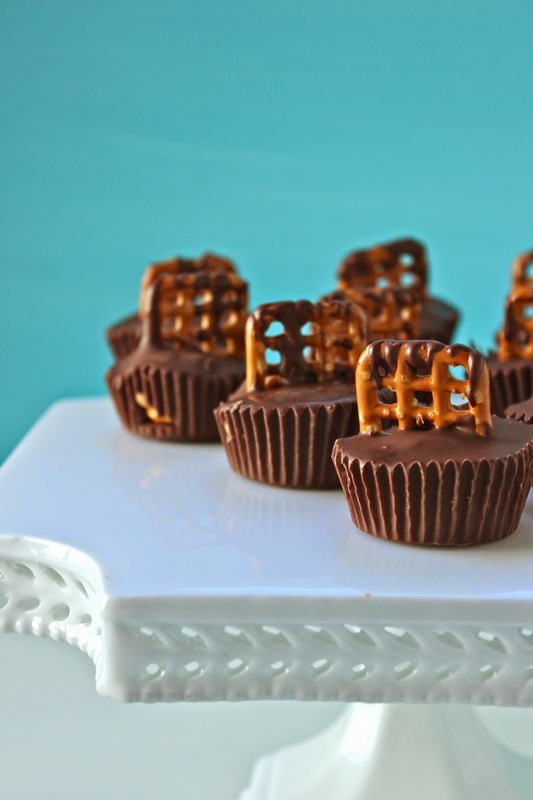 You will probably drizzle some chocolate over the top pretzel. That's ok! I drizzled extra chocolate on at the end to make it look purposeful. Freeze for a minimum of one hour before eating. 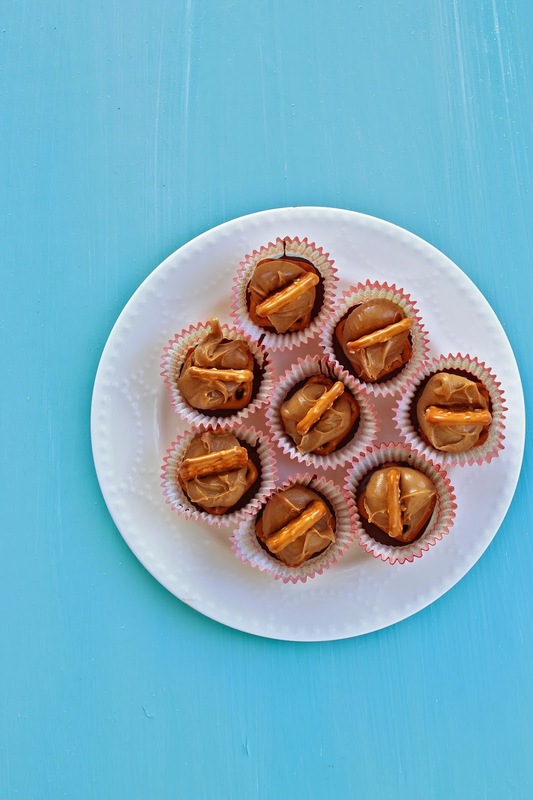 Remove the peanut butter cups from the muffin-liners and store in a ziploc bag for weeks. 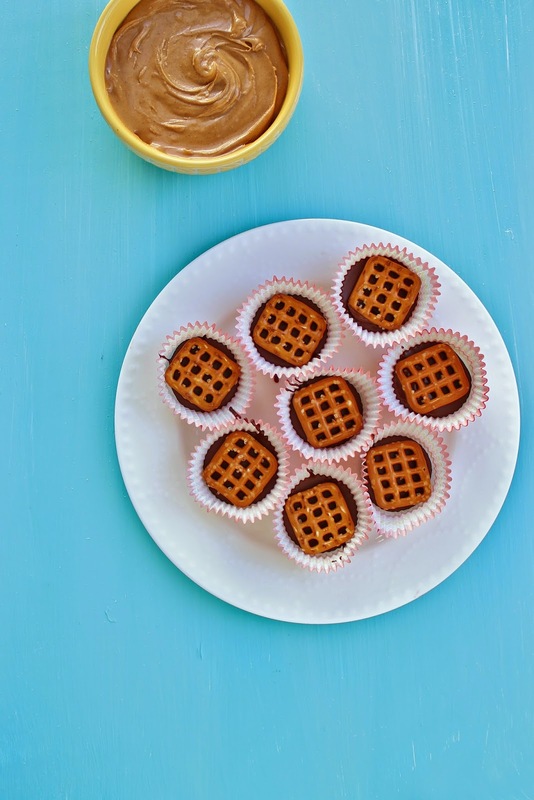 *If you have a mini-muffin tin, use that. 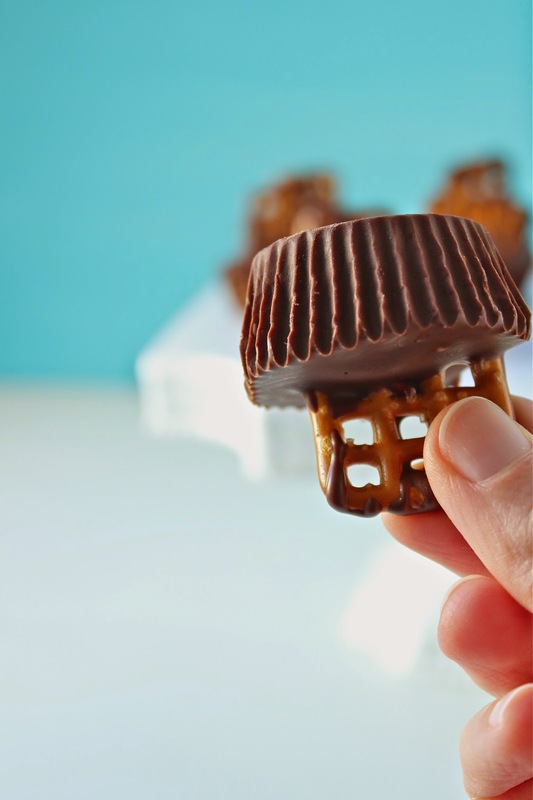 It will help the peanut butter cups be more uniformly shaped. My current school schedule involves driving to Raleigh three days a week for an externship. I've enjoyed the externship so far, even though it is a thirty minute drive there and back. As much as I thought I would love being in graduate school, it turns out that studying and writing by yourself in the library is only fun for so long. It feels sooooo good to interact with other people and to write about real issues and cases that matter right now. The one downside of my externship is that I don't have time for lunch. Two days a week, I work from 9 to 12 and then have to be back on campus for class at 1. So, I eat lunch in the car. Not ideal, but not exactly the worst situation either. The only problem is that my usual lunches consist of leftovers or some variation on these salads, neither of which work very well when you're trying to steer a car and eat at the same time. The wraps and sandwiches of my youth were a very standard (but delicious) combination of turkey, provolone, lettuce, and italian dressing. 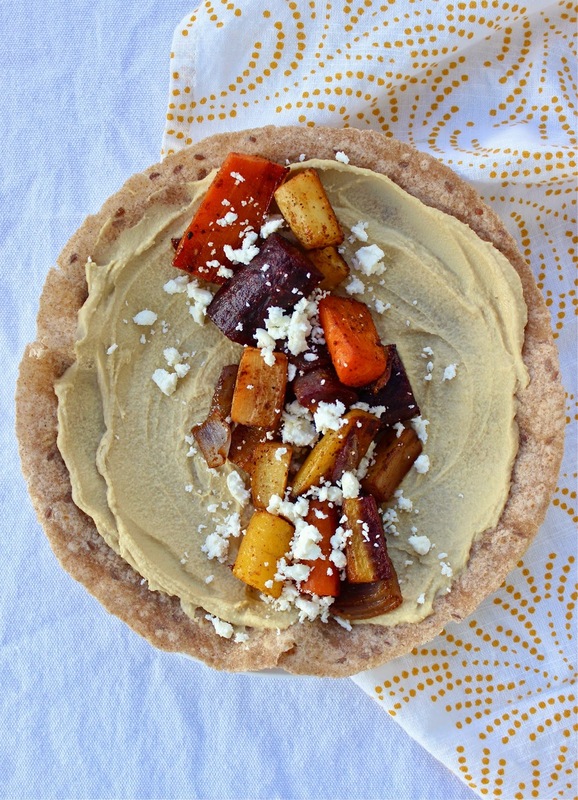 These days I've been mixing it up with spiced roasted veggies, and I've discovered a few variations that were too delicious not to share with you. 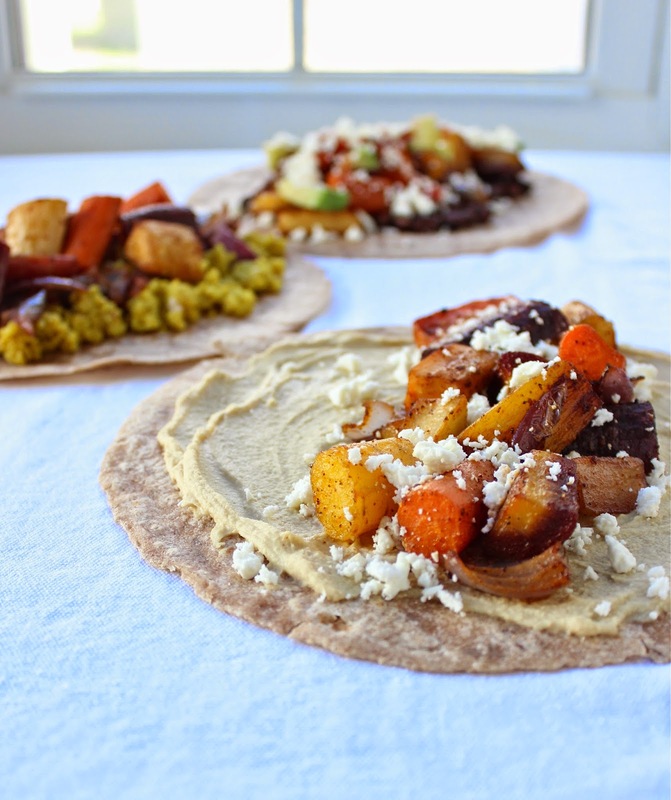 The veggies are tossed with cumin, paprika, chili powder, and grape seed oil, roasted on high heat to utter vegetable perfection, and then spooned into wraps with other tasty ingredients. This one is my favorite. It can be made well in advance and is delicious cold or warm. The avocado is crucial here. Add hot sauce if you like! 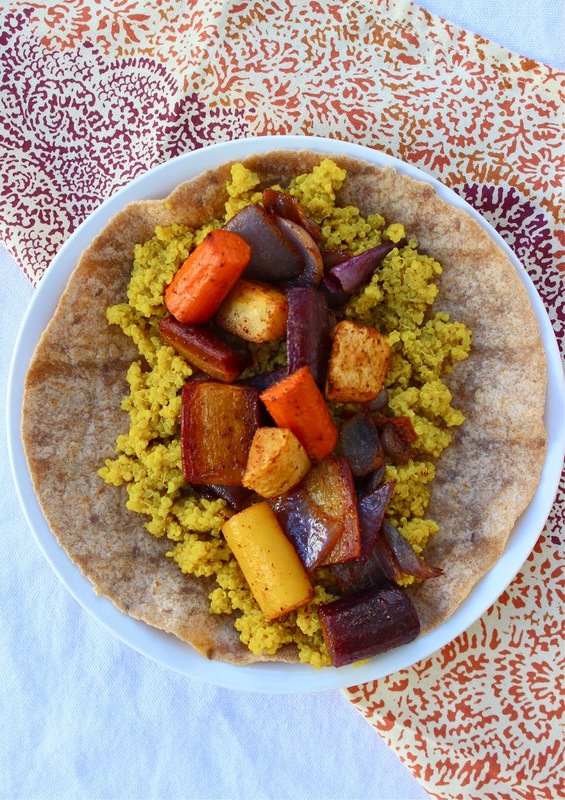 Make a batch of this quinoa and you're set with lunch for the week. Tons of flavor going on here. 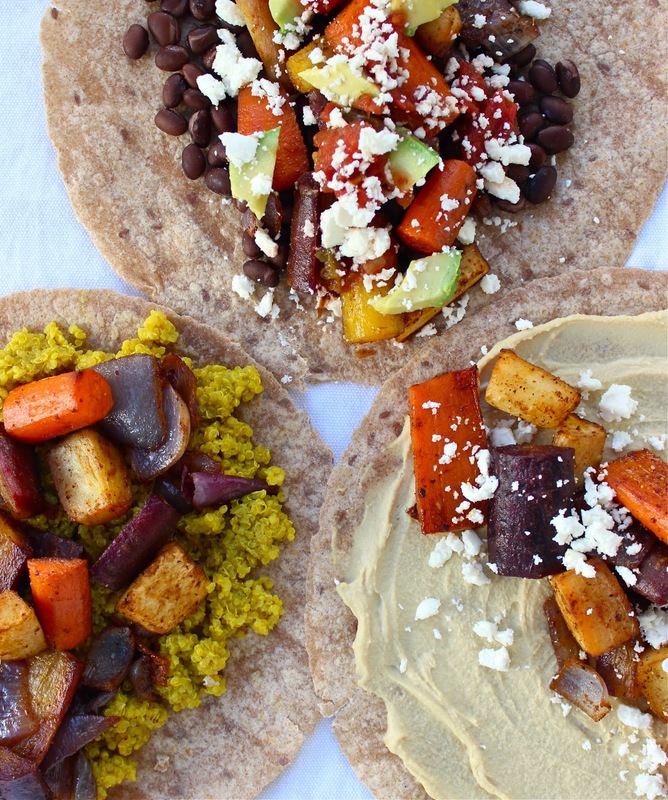 These wraps keep you full, (thanks to the protein in the hummus/beans/quinoa) and they're FUN. We're all in need of a little color and brightness in the winter, I think. I'd love to hear what you like to put in your wraps, or any other one-handed meal ideas! Preheat oven to 450. Prepare two cookie sheets by lining with aluminum foil. Lay the veggies out evenly among the two cookie sheets. Sprinkle with cumin, chili powder, paprika, and salt and pepper. Drizzle with grape seed oil. 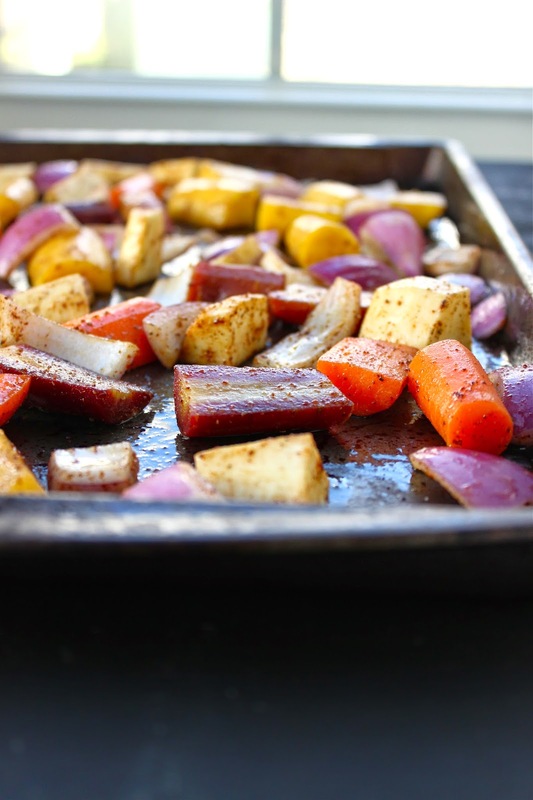 Use your hands to toss the veggies with the oil and spices until each piece is evenly coated. Bake at 450 for 15 minutes, stirring veggies halfway through to prevent burning. I used grape seed oil because it does better at high temperatures, but you could also use olive oil or another neutral oil. Any mixture of veggies works here. 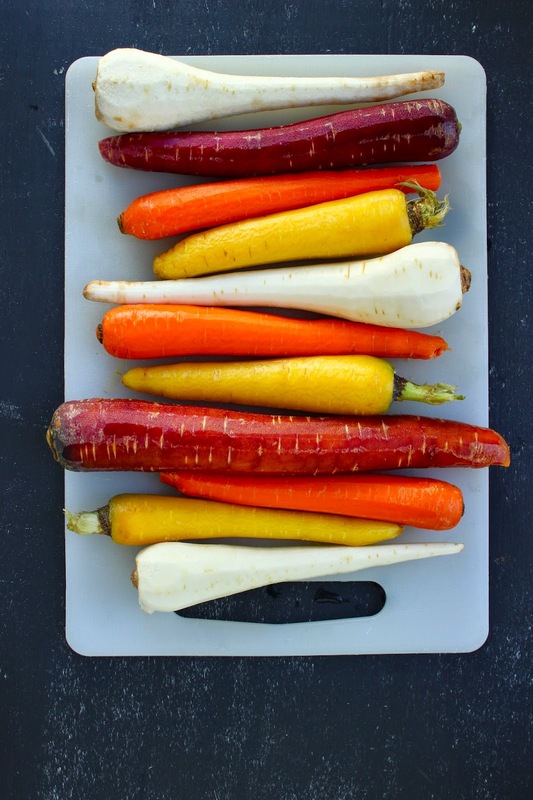 I used this multi-color bag of carrots from Trader Joe's, but regular carrots work just fine. You could also substitute some of the carrots for a sweet potato or some butternut squash. For a little more spice, sprinkle on some cayenne pepper. Heat olive oil over medium-high heat. Add spices and stir for one minute. Add quinoa, and stir for one minute more. Add coconut milk and water. Bring to a boil, then cover and reduce heat to low. Cover for 15-20 minutes or until all the liquid is absorbed. Let rest for 5 minutes and then fluff with a fork. Quinoa inspired by Cookie and Kate. W.H. Auden, "As I Walked out One Evening"
It's interesting how our perception of time changes as we age. I read an article once about children's experiences in the juvenile justice system. The author argued that the entire experience had an enormous impact on children because of their perception of time. For a 13-year-old, 8 months is a long time --partially because of a child's perception of the future, and partially because 8 months simply represents a greater proportion of a child's life than an adult. 8 months looms larger in a 13-year-old's life than in a 35-year-old's life. The older I get, the more the cliche expression rings true for me: Time goes by so fast. The good weeks, the bad weeks--everything. This past semester, there were several weeks that I dreaded long in advance. Weeks with long research papers or work-projects or cite checks, all coming at once, or that particularly dreadful week of 3 exams in 4 days. But you know what? It all came, it all went, and I survived. Some of the hours were in fact dreaded and long, but most went by quickly. Then I had a period of much anticipated good things. My birthday! A trip to Italy! Christmas! All of it wonderful. All of it went by quickly. Again, my un-profound realization--the hours are long, but the weeks and months and years are short. Let's be better at loving our crooked neighbors with our crooked hearts, finding the good moments even during the bad weeks, and remembering that life is a blessing. I doubled this recipe to make 2 loaves, one for us, and one for our real-life neighbor. Although I've lived next to her for almost a year, I'd never actually spoken to her until mid-December when she brought over some bread and her contact information, asking us to keep an eye on her house while she went out of town. It was such an unexpected, lovely gift. It made me happy, yet also sad that it had taken so long for us to have a real conversation. 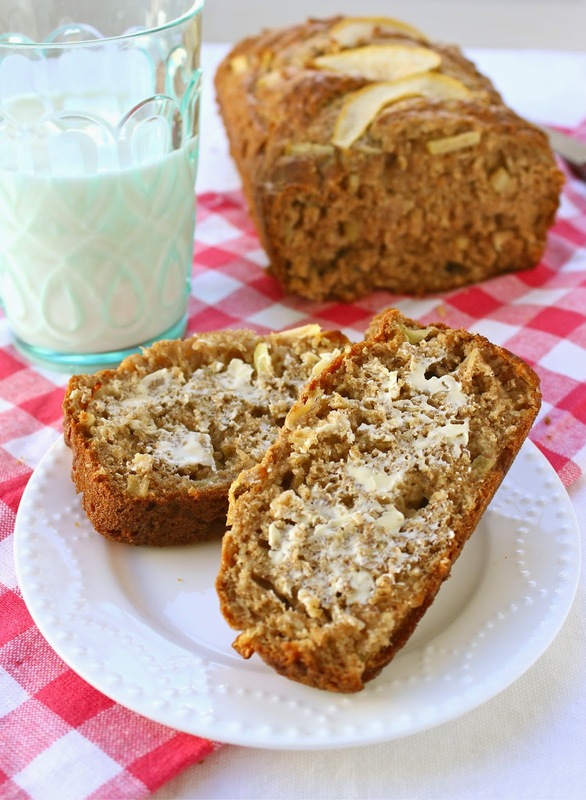 Today, I'm going to return the favor with this apple cinnamon oatmeal loaf. I hope you'll make some bread and share it with your real-life neighbors too. *I don't usually have quick-cooking oats around, but you can make your own by pulsing 2 cups regular old-fashioned oats in the food processor a couple times. 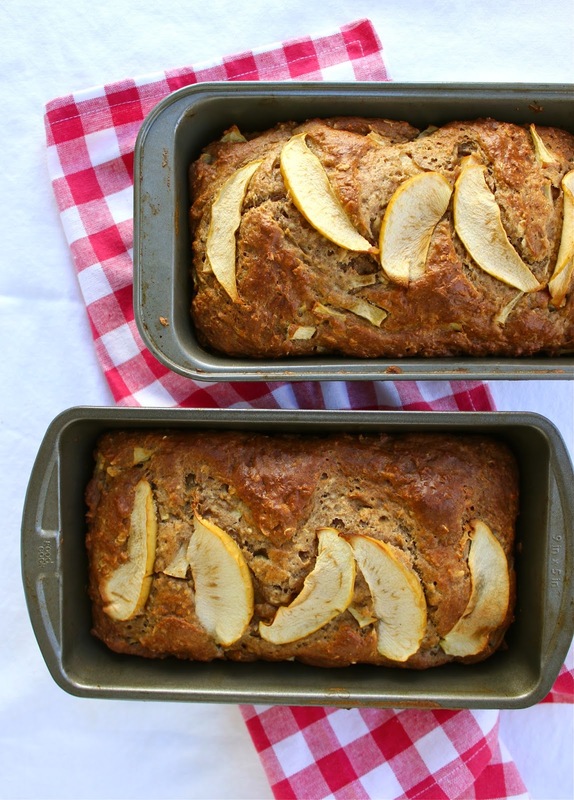 Preheat oven to 350 and prepare two loaf pans by spraying with non-stick cooking spray. In a large bowl, combine vanilla extract, eggs, canola oil, brown sugar, and banana. Add flours, baking soda, cinnamon and salt. Stir to combine. Add oatmeal/yogurt mixture. There will be a lot of dough and it may be difficult to stir. Use a wooden spoon and your biceps! When all ingredients are incorporated, add the apples and stir to combine. Divide batter evenly into the two pans. (It will be thick!) Use a spoon to even the surface. 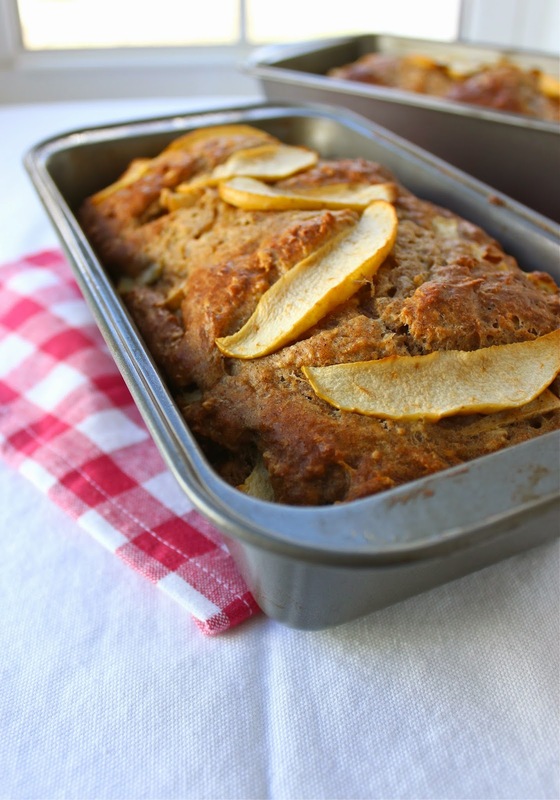 Top with thin apple slices for decoration, if desired. Bake at 350 for 40-45 minutes, or until the top of the bread is golden brown. So, my first post of 2015 almost didn't happen. In what I hope is not an sign of my luck in 2015, I accidentally deleted all the new photos from my SD card before they were loaded onto my computer. Thankfully, after a few choice words, a few tears, some whining to Adam, and a lot of test programs and google-searching, I got the photos back. Maybe my word for 2015 should be perseverance. As I have previously documented, I have a deep seated love for ranch dressing. Lots and lots of Hidden Valley Ranch dressing and baby carrots to be exact. Though I usually stick to vinaigrettes these days, I still enjoy the occasional ranch dressing splurge. If I'm being honest, my very favorite salad would probably involve ranch dressing, something crunchy, and plenty of good cheddar cheese. Given everyone's penchant for salads and healthy things in January, I thought a salad would be a practical way to start the year. But I also wanted the salad to be yummy, craveable, and loaded down with ranch dressing. 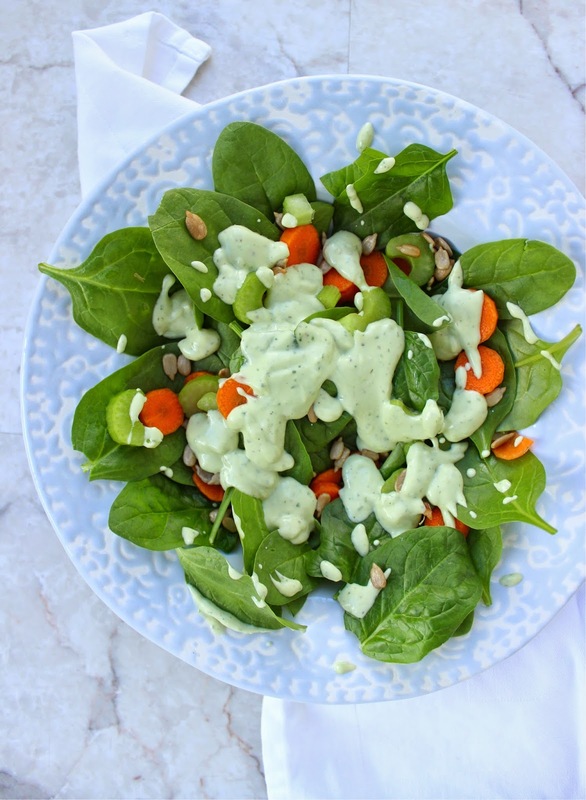 This healthy avocado ranch dressing satisfies my childhood ranch dressing craving while still being filled with healthy fats and protein-rich Greek yogurt. I brought it, along with a veggie tray, to a New Year's Eve party last week. Everyone dug in and no one noticed that it wasn't the normal saturated-fat-laden kind. And of course my picky husband, who "doesn't like Greek yogurt" was dipping veggies in it along with the rest of them. 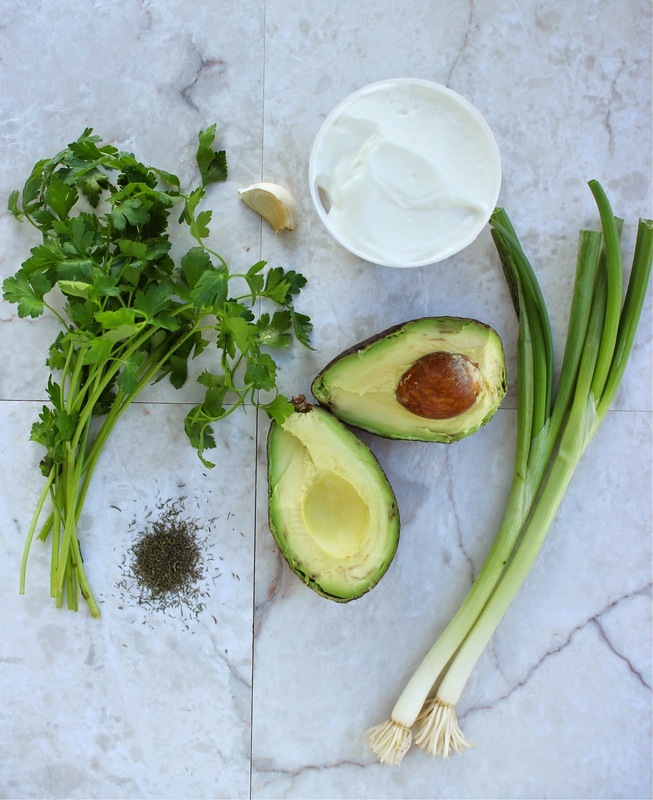 This dressing has the potential to make your New Year's salads much more interesting. 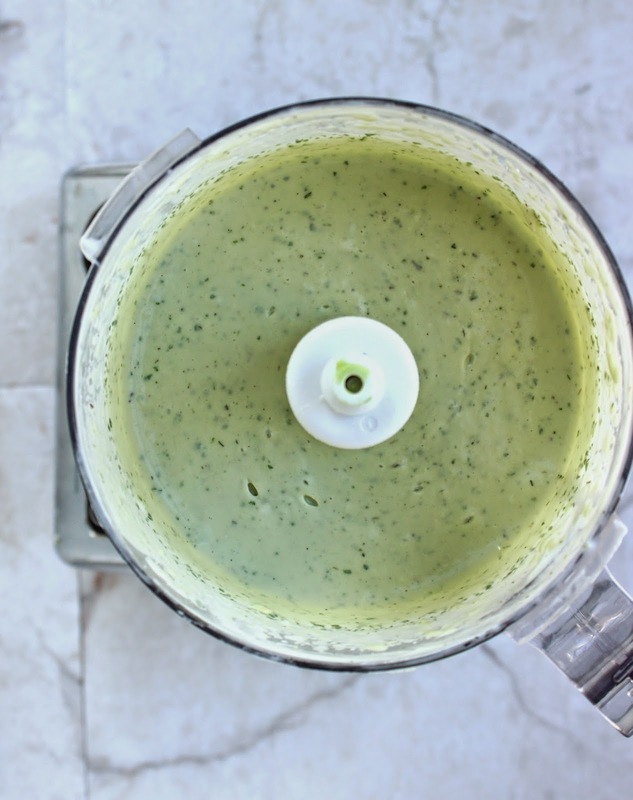 Combine all ingredients in a food process or blender. Blend until smooth. Serve immediately or keep in an air-tight container in the fridge for up to a week. 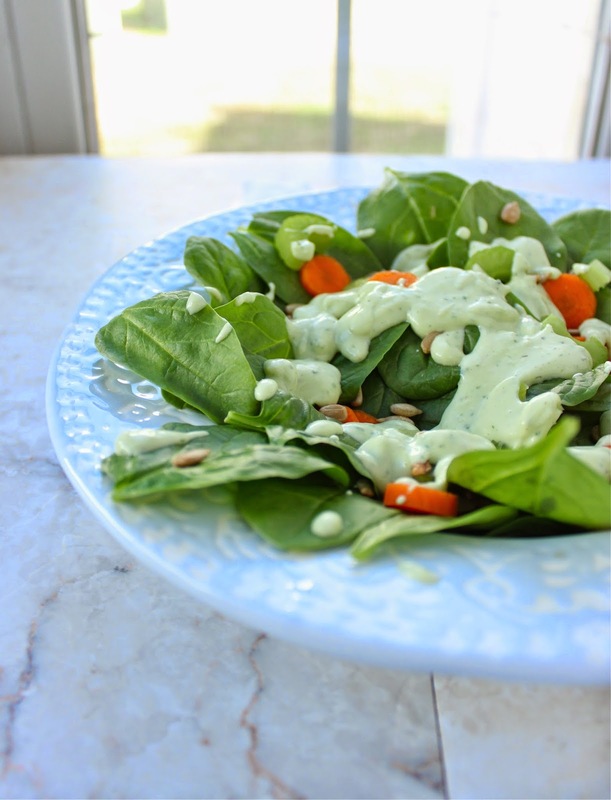 This is a thick ranch dressing, perfect as a veggie dip or on salads, but if you want it to be thinner, add a couple teaspoons of milk or buttermilk. 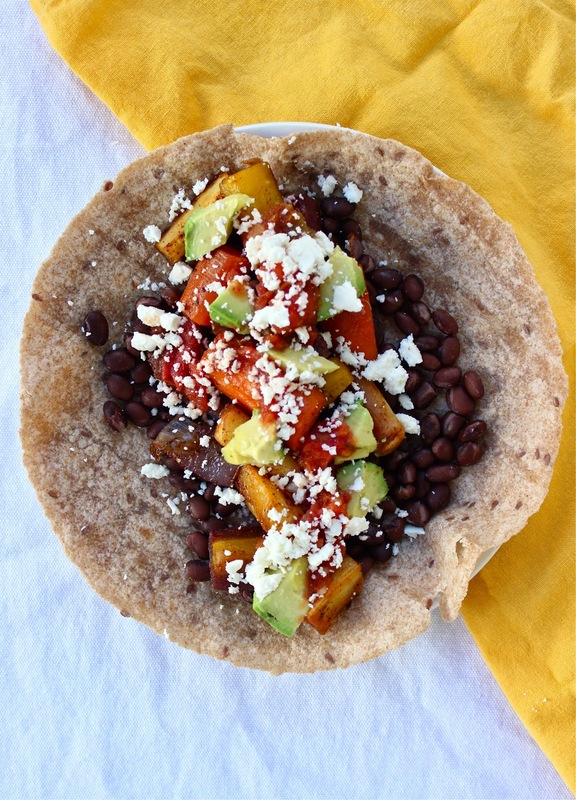 Other serving suggestions--drizzle over pizza, tacos, fish, chicken, veggie rice bowls, etc! 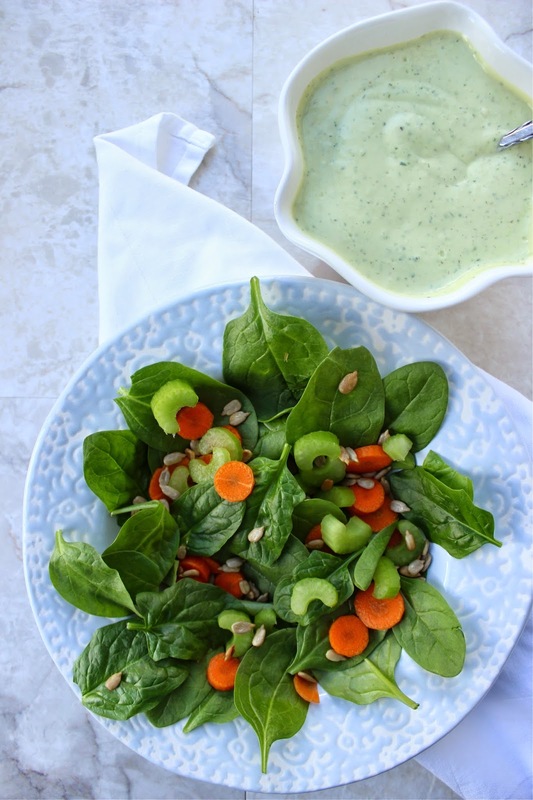 This salad is a mix of spinach, carrots, celery, and --my new favorite--roasted sunflower seeds.